Gary and Jane Gibbons of Tampa say there's a better way! 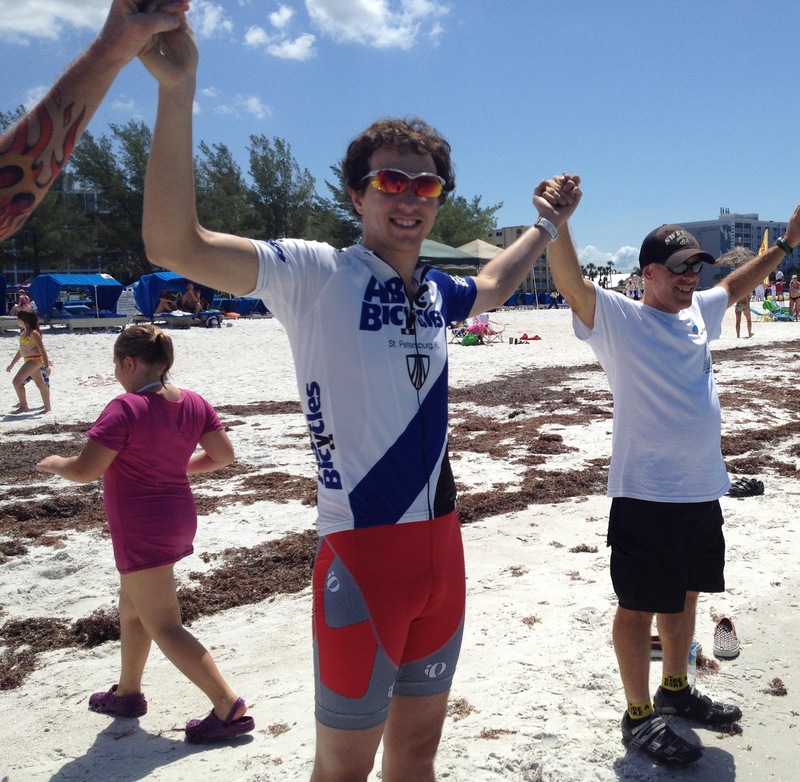 350 joined Hands Across the Sand Saturday at America’s #1 beach destination, St. Pete Beach. For the 3rd year in a row the event was hosted by the Tradewinds, Tampa Bay’s best known beach resort, at their newly rebranded Guy Harvey Outpost, the first such beach venue to incorporate marine conservation art and activities into the visitor’s experience. They came to say no to offshore drilling off America’s Best Beaches on Florida’s central gulf coast, and to say yes to clean energy, yes to Tampa Bay’s $6 billion beach tourism economy, and yes to moving beyond Florida’s dependence on oil. In the most dangerous state to ride a bike or walk down a street, lacking much of the basic transportation choices most Americans enjoy, many came not by car but by PSTA trolleys or in electric vehicles. 20 cyclists rode from the Bay to the Gulf to say NO to Oil. Kofi Hunt and Ren Reilly of St. Pete say "Let's Break Our Addiction to Oil!" Before Hands were joined at noon, Pinellas Suncoast Transit Authority (PSTA) joined speakers from Gulf Restoration Network, Sierra Club, the Tradewinds, and the local family-owned fishing and shopping center John’s Pass Village at a press conference. In the near future PSTA plans to create vastly expanded bus service, Rapid Bus Transit, light rail connecting Clearwater and St. Petersburg, and safer streets for bikes and pedestrians. These long overdue infrastructure improvements will, at long last, provide residents and tourists alike with the transportation choices most Americans and Europeans now take for granted, the lack of which now keeps Floridians dependent on oil and keeps their air quality at unhealthy levels due to how much oil most of us now burn, not because we want to, but because we don’t yet have access to the safe choices we need in order to move beyond oil. Sierra Club’s Florida Healthy Air Campaign is building support for a community consensus that this full range of transportation improvements, investments that will benefit both our economy and our environment, must be carried out post haste.